Moving companies offer a variety of services to their customers. Not everybody wants or needs to pay for a full service move. Sometimes all you need from a moving company is transportation for your belongings. This is when you should hire just a moving truck and driver from a moving company, with no movers. The costs of moving can add up quickly. You can save money on your move by doing some of the work yourself. But money is not the only reason why you should hire a moving truck and driver instead of just renting a moving truck or paying for full-service. Physically moving and packing your belongings can be done by a team of friends and family. Your load needs the space that a moving truck provides and there is nobody among your amateur moving team who has the time or ability to drive a rental truck. You can handle the physical stuff, but distributing weight on a truck and using its restraints is something requires professional guidance . You need to store your belongings with a moving company temporarily if you need to delay the unloading process. Make an appointment early. 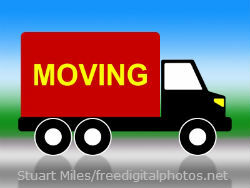 Moving companies get busy and even if your move is mostly DIY, it comes to a screeching halt if there is no truck. Accurately measure the size of your shipment. You can determine what size truck you need based on this information. If you can get one for free, have the moving company send a representative for an in-house estimate. You can be sure that the truck that they send you is appropriate as opposed to guessing when dealing with off-site estimates. You will need to create an inventory of your items. Remember that there are some items that moving companies are not allowed to transport. Ask about insurance options. Remind the company that you will be the one packing and loading the boxes in case that affects the company's liability for damage to them during the transport process. Make it clear that you only want a truck with a driver and will be purchasing no additional services from the moving company. Every legitimate moving company should be able to do this for you. Always get at least three different price quotes when you ask for any service from a moving company. This will help you find a fair price for the services you require. This is important because some moving companies will have a base pay deal that would be the same as having a few movers on site, while others will give you a true discount for not needing any moving labour beyond a truck driver. Pack your items in boxes and shipping containers well before the scheduled arrival time of the truck. You can be charged for the time the truck is parked. Ask the driver the best way to load and restrain items on the truck. Let him help if he wants to, but he may expect extra payment if he does. Try to load the truck in a logical way: heaviest items first, smaller items closer to the back door.